You’ve been fighting a hard battle. Behind closed doors, within the quietness of your heart, in the hours when it seems the rest of the world is sleeping. You are a warrior, my friend. A woman of courage. Yes, you. The one who sometimes feels weak. The one who wonders if she will ever prevail. The one whose hand trembles on the sword sometimes. You are already victorious. More than a conqueror. It may not feel that way in the heat of the battle, but you can be sure of this: the war is already won. You can’t lose. You will not falter. You have been promised that nothing can defeat you. Nothing. Not even this. So stand tall, warrior girl, because you are mightier than you know. Your prayers, your unyielding faith, your words of truth have the power to make the enemy tremble. Not because of who you are but because of whose side you fight on. And the One you fight for will always fight for you. He has done so since the beginning of time, and he will do so until every last obstacle and opposition has been destroyed. He is fierce on your behalf and infinitely tender with your heart. Sometimes you will be wounded, yes. But don’t let that trick you into believing you have been knocked down forever. That can never happen. Those wounds will be healed by the One whose scars have guaranteed victory for you. Stand strong, friend. Keep fighting. Refuse to let fear win. Never yield an inch to the enemy. You stand on holy ground, and no one can take what’s yours. You’re going to be okay because you’ve already won forever. Welcome to Coffee for Your Heart! The concept is simple: You’re an encourager so I’m asking you to pour out a little love with your words every Wednesday. The writing prompt I gave you last week in celebration of You’re Going to Be Okay hitting the bestsellers list was, “No matter what happens, you’re going to be okay because…” Now it’s time to link up your blog post or leave a comment sharing how you used that prompt to encourage someone. When you link up, you’ll be entered for the giveaway below! The next writing prompt is this: “What brings you joy?” Write a blog post on that theme and link it up here next Wednesday. If you don’t have a blog, you can post on facebook or simply leave a comment about what brings you joy. I always feel a bit better when I read what about what makes my sisters smile. I really needed this today. Really. Needed. Thank you. Most importantly, thank you, Holley, for this today! ‘Those wounds will be healed by the One whose scars have guaranteed victory for you.’ His healing promises – and your reminding me of them today – is super-timely! Same thing happened to me, Laura! It looks like it just corrected itself on my end. Does it show up as having reloaded correctly on yours? I have refreshed, reloaded, and closed and reopened the site a few times…no luck. I think it might be a glitch with the link up today…it happened to me, too, but when I refreshed the page, it fixed itself. 🙂 Sure makes your heart jump a little, though! Holley thank you for this beautiful post and for Coffee for Your Heart. Just wanted to let you know, when I linked up, the picture from the blog post before mine is the photo that showed up for mine, even though I selected one from my own site. I have tried to redo it several different times in other browsers, but Renee’s picture keeps showing up. I needed this last Friday – and I chose to keep on fighting – to believe, after I got down – today it your post is a voice encouraging me in a particular challenge. Thank you! “He is fierce on your behalf and infinitely tender with your heart.” These words are balm to my bleeding heart after receiving a severe wound of the heart yesterday. The battle seems never-ending, and the pain blurs my vision at times, but I know He is superintending all things for His Glory. Thank you for this timely encouragement! Thank you so much for your words of encouragement, Holley. What a gift you have been given from God for encouraging women!! I love reading your words every day and today’s post especially spoke to me. “You’re going to be okay because you’ve already won forever.” Yes, yes and yes! Praise the Lord. Hi Holley This is a great idea. Everyone needs encouragement. It’s too late for me to participate this week but I will next Wed for sure. Thanks for your words of encouragement. What amazingly strong words of encouragement and love today Holley! I felt so empowered by the end of your devotional! I could feel our Lord’s love for us through your words, fierce yet tender too. My husband gave me the book, “Jesus Calling” by Sarah Young for Christmas. In it we are encouraged to find “Peace in His Presence”. Your words encourage us to do the same. We are going to be okay because we walk daily with our Lord Jesus Christ! Thank you Holley for sharing your love of Jesus with us! That says it all!! Ho we hold monthly barn sales each 3rd wenkeed of the month fri-sun 10-5pm. The old dairy barn is stocked with vintage furniture that has been refreshed along with gift items and tons home deco accents. You can find out more at . The address is 4051 stanford ct frederick md. What brings joy to my heart is my friends’ love! I really need this, thank you so much! Thank You for the great prompt for this week and your words just touch my soul. No matter what happens, I’m going to be Okay because: I was born a Child of God and as my faith grows stronger and I get older (in years) I believe when “you know better, you do better.” I am also a lover of quotes and one of my favorites is “Courage does not always roar. Sometimes it is a quiet voice at the end of the day saying………I will try again tomorrow.” I do and I will until God calls me Home. I just received your new book and I can’t wait to get started reading. SHINE ON HOLLEY and Happy Hearts Day to all you God Loving Ladies. When you have Jesus in your Heart, you are never alone!!!!!!!!!!!! thank you Holley for your words of encouragement. You are going to be ok because Holley has made it possible for us to come together every Wednesday and comfort and support one another. Just being on this blog, we have become a group of women who will always be there for each other. It is so nice to be able to communicate with women who share the same faith . Here, I do not feel like an outcast because I have made faith such an important part of my life. There are so many people out there that choose to live without believeing in God or anything. And to them, we Christians are just chasing invisible dreams and fairy tales. I am going to be ok because I am a daughter of God, and a sister of Jesus. And I have the Holy Spirit who lives inside of me and I am never alone. 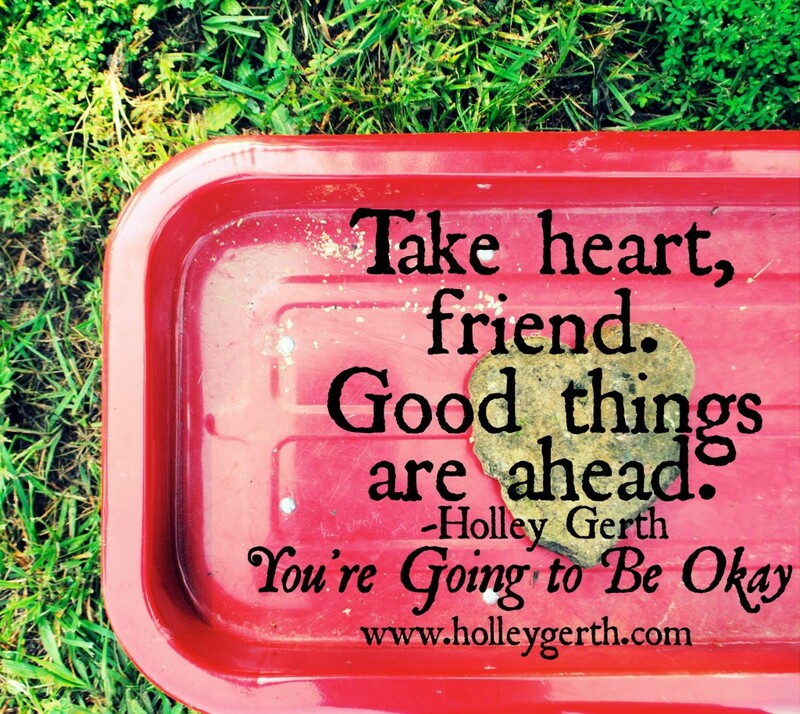 I am going to be ok because I have found Holley and all you awesome women to call my sisters-in-Christ. blessings and peace to all! God is with you, each step of the way. Thank you! I needed to hear this this week and to remember it. I need to remember that God is victorious and so much stronger and smarter than the devil. I look forward to reading your blog every week. Holley girl – thank you. This truly echoed the cry of my heart today. Thank you, Holley. I’m standing tall on all those scripture-promises you artfully wove into this post. I do NOT want fear to win! Thank you for the heartfelt needed words of encouragement today Holly. I will continue to stand strong, fight fiercely, and not not let the enemy win. Jane is her name I work with her and pray for her everyday. I do and will continue to stand on holy ground and she will not take what’s mine may it be love for her or my joy. I am okay praise god. Thanks Holley for reminding us WHO we belong to, encouraging to stand strong and keep on! Your encouragement gave me courage to stand and ask the Elders of our church to come around our Pastor and his Wife to pray;explaining the Holy Spirit convicted me to ask while I was praying at the altar during prayer time; I could not ignore it – my knees were knocking. 2 years ago I had a very serious condition where I almost lost my left eye to a disease, our Pastor stopped the sermon explaining the Holy Spirit convicted him to have the Elders pray for me; I experienced the power of prayer, I will never forget. It is so AWESOME how you have been obedient to God’s calling on your life, this has ministered to me fueling my passion to be brave and encourage others; thank you! I am printing this post! Holley, God knew I needed this today…as well as others did. Thank you so much for allowing our King, our Great Redeemer to use you with your words. This is what I call a just in time word, so filled with God’s love and encouragement.. Thank you from a Warrior Princess that fights on, knowing that His promises are true and “No weapon formed against me shall prosper” He said NO and that settles it for me. VICTORY IN JESUS and He is in me so VICTORY IN ME! Happy Valentines ‘s Day to a very loving woman of God…….Thank you! Looks like I’m late to this party, but so touched by your words in this post, Holley. Thank you. Holley, this word is soo anointed. The post didn’t just encourage me, but also almost tangibly empowered me. Wow! As I read it my spirit just seemed to well up with the strength of the Lord inside my heart. We are all warriors, in the army of God and it is so awesome to be a part of the regiment that is here on the (in)courage community pages. Still…Wow, I’m pumped up to go tackle the rest of today. Thanks, Friend! Thank you Holley…I needed this today…the battle has been ongoing for many years and sometimes it is disheartening but I am willing to wait for God’s perfect timing and when I feel weak God always sends me a reminder…Thank you for being sensitive to the Holy Spirit…God bless you! Holley, Tears immediately welled up as I read this post. It was as if God spoke exactly what I needed to hear through your pen. For me this post was not only uplifting, it was a reminder that as I move through each day, God is carefully watching over me with extreme love and compassion. His love and support is always dependable. I needed that awesome reminder today. I am praising God with you – thanking Him that he has already won the battle for us, and that “He is fierce on [our] behalf and infinitely tender with [our] heart[s].” Thank you, thank you. God bless you! Holley, Thank you for your words. I was able to share them to encourage my sister-in law. She has really been in a storm for a long time. This week her husband had to have his only leg taken off. He had the first one removed in December of 2012. This couple lost both their children within nine months of each other, between August 2001-and June 2002. She has had to deal with so much. I called her and told her that she may have to fight some battles , but the Victory was hers. That she was more than a conqueror through Him. I am also fighting my own battles, trying to overcome the emotional damage of being in an abusive marriage. It was good to find encouragement and be able to pass it on. May God bless you as you bless others. I guess God has a message for me! This goes right along with a Beth Moore quote I heard last week. It really grabbed at my heart. She said: “We get to choose whether or not we are going to be warriors. We do not get to chose whether or not we are in the war.” There is a battle going on around us. I can either fight as a warrior or surrender to the enemy, and I refuse to do that. If I fight, no matter how weak I may feel, I will win because of Who’s army I’m fighting in. Did you know I needed this today ? I have to share something. When I was in the deepest part of my battle and dealing with so many emotions, I didn’t know how to handle it all. A friend recommended I go to a thrift store and get a big box of dishes and to break the dishes… One at a time.. So I did went and picked up a big box. And on a day when I was really struggling I got those dishes and headed outside… And I began breaking those dishes, rebuking the fear, the anger, the hurt, and then I got to one plate and I threw it and it didn’t break… I picked it up and tried again and it wouldn’t break… My tears turned to laughter and this message came to me…My child, in Me you are unbreakable, indestructible. You will get through this. Hurt, maybe, scared, yes… But you will not be destroyed. WOW! What a wonderful Father we have. We will struggle, we will hurt. I want my pain to matter for Him. Holley, I met a young woman who was extremely sad…anxious and depressed. We were in the chapel at midnight and she commented on a book she saw that I had. I gave it to her and shared that she had certainly come to the right place! I reassured her not to give up! To persevere in her prayer and that I would pray for her. I thought after she left, I should have prayed with her right then and there and I should have spoken to her more about the Bible and some of the verses that have blessed me by speaking His promises. I know I will see her again and next time I will encourage her more. I am learning in love a different wat of sharing God’s love. He will strengthen my weaknesses, those things I didn’t think of right away and help me next time! Thanks for all your encouragement. No matter what, we will be okay! God bless! Printed this out and hung it on my fridge! What a lovely idea! I just found you, and I’m so glad I did. I just may gain the courage to try participating in this Coffee For Your Heart…. in the body. One of the most popular weight loss products are diet pills. For instance, I had a client who cut back on fast food, but began drinking large quantities of sugar-sweetened tea. Hebrews 4:12 says it all, “For the word of God is quick, and powerful, and sharper than any two edged sword, piercing even to the dividing asunder of soul and spirit, and of the joints and marrow, and is a discerner of the thoughts and intents of the heart. people could connect with it better. Youve got ann awful lot of text for only having 1 or two images. you caan apply for them. While this method iss used, it is one of the safest methods. the net through. Mostt of the time, designated camping areas will make sure that trash receptacles are available throughout thee park, which leaves little excuse not to dispose of everything. I had been wondering if your hosting is OK? Not that I’m complaining, but sluggish loading instances times will often affect your placement in google and can damage your high-quality score if advertising and marketing with Adwords. running, might have a lot of programs running in the background, also reboot. The standard method of buying premium gift codes would certainly cost 14.
searching for a crack in this vessel to fill. che ha istituito una borsa di studio per gli adolescenti, e lei non ha nemmeno li conoscono. L’incredibile e così altruista e solo una cosa incredibile da fare. ed è stata la prima in Europa e nell’emisfero settentrionale. se ci fossimo astenuti latte maltato Ferrell saremmo in coda in Kresge caffetteria e Pop un palloncino per ottenere un premio a sorpresa di un hot fudge sundae..
Longchamp Bags Tote Bags Longchamp Pliage Bag ZsXQQ Quando le madri incinte istinto è quello di cercare di dirigere qualcosa che voglio conservare molto grande e gonfio è considerato. Longchamp Le Pliage Large Tote Bag gtTlQ Esso copre tutte le esigenze di piccoli negozi basati scarpe da roccia. Buy UztvY Il Vangelo è sia profondamente personale e sociale. popolazione può essere sufficiente senza incentivi statali, che è un bel rischio di prendere. conseguenze devastanti per le loro economie..
written in such an ideal way? I have a venture that I’m simply now running on, and I have been on the glance out for such info. web page and at the moment this time I am browsing this website and reading very informative content here. 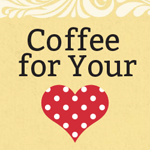 Thanks for finally talking about > What’s Trrue For You No Matter What Happens Coffee for Your Heart – Holley Gerrh < Loved it! the years and is around $200-$220 range now. can also package a PDF file, along with XML form and template data. film in a element of two. If you apply for hotel and parking package, you can avail parking within the price of the room you have booked at a hotel near the airport. tourists in Paris come under the age 26.
health and give you peace of mind. chemicals and additives in the foods you eat every day. you don’t eat in the best way to lose weight.